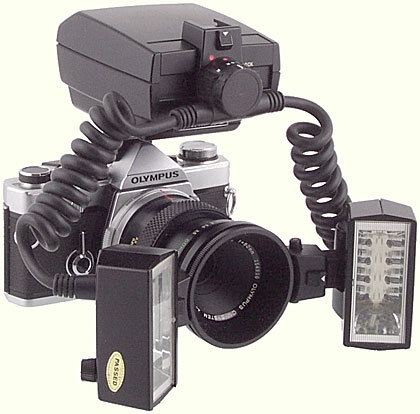 The T28 Macro Twin Flash 1 is one of 4 macro flash units for the Olympus OM cameras that use the T Power Control 1 and provide automatic exposure using the camera’s TTL flash control, so that you do not need to calculate the additional exposure required by magnification. It has 2 flash heads, and these are normally attached to the Macro Flash Shoe Ring that fits the filter mount of most of the Zuiko macro lenses. The Twin Flash provides more light than the T10 Ring Flash, and avoids the shadowless illumination that is associated with ring flashes. The 2 heads can be angled and rotated separately to alter the shadows on the subject, and diffusers and neutral density filters can be added to one or both heads to modify the illumination. The built-in modelling lights can be used to judge the effects. First screw the Shoe Ring onto the macro lens, and then attach the flash heads by sliding them into the shoes on the Ring. The heads lock into place using a groove in the base of the foot. To remove a head, push the button on the front face of the shoe in the direction of the white arrow, and then slide out the head. To attach the plug to the Power Control, align the red dots on the plug and the Power Control, insert the plug, and turn it clockwise until it clicks and locks into place. To disconnect the plug, press and hold the small black button on the front of the Power Control, turn the plug anti-clockwise until the red dots are aligned, and then release the button and withdraw the plug. The plug that attaches to the Power Control carries a rotary switch that allows the left, right or both flash heads to be used. On top of the plug, there is an accessory shoe to which one of the heads can be fitted. When fitted to the Shoe Ring, the flash heads can point directly forwards, or they can be tilted inwards through about 65° to aim them at the subject, or they can be tilted outwards by about 45°; there are click stops at 7 positions. 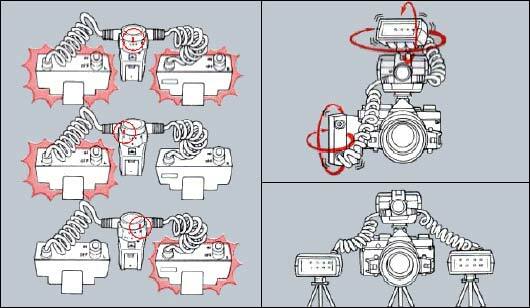 The flash heads can also be rotated through 360°, with click stops at 45° intervals (rotation is restricted to 45° when tilted inwards at 65°). The shoes can be moved around the Ring when the 2 black buttons on either side are held in; releasing the buttons locks the shoes in place. The accessory foot on each head has a ¼ inch socket in its base; when the Shoe Ring is not used, this allows the head to be attached to a lighting stand or a tripod. The flash heads contain small bulbs that act as modelling lights and can be useful for focusing in dim light and to preview the lighting and any reflections. 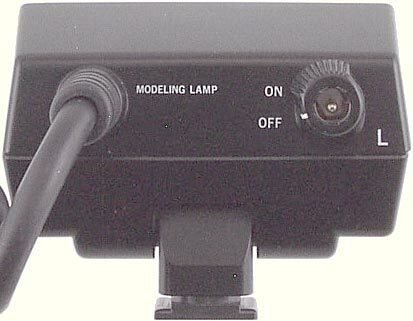 The modelling lights are much less bright than the flash, and so they do not need to be turned off when a photograph is taken. The socket at the rear of the head for powering the modelling lights is a standard 2.1 mm DC power socket. Power for the modelling lights can be provided from either the 6V Power Pack 2 or the AC Adapter 3. A ring around the power socket can be turned to switch the modelling lights on and off. By reversing the Calculator Panel at the rear of the T Power Control 1, manual flash is possible, with a choice of 2 apertures. The Panel is calibrated for a single flash head; if both heads are used, then the film speed should be set 2/3 stops lower. The T Power Control 1 is essential. The Macro Flash Shoe Ring is used to attach the flash heads to the 49mm or 55mm filter mount of a lens. The diffuser and filters in the ND Filter Set T32 can be used to reduce the light output of one or both flash heads. The modelling lights can be powered by either the AC Adapter 3 or the 6V Power Pack 2. A Calculator Panel for use with one flash head and 50mm lenses was supplied. Self-adhesive labels were provided with the T Power Control 1 to stick onto a Calculator Panel to provide readings for manual flash with one flash head and the Zuiko Auto-Macro 20mm f/2, Zuiko Auto-Macro 38mm f/2.8, Zuiko Auto-Macro 80mm f/4, Zuiko Auto-Macro 135mm f/4.5 and 50mm lenses (including the Zuiko Auto-Macro 50mm f/3.5). 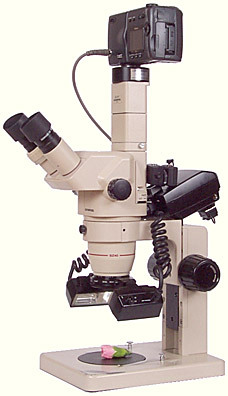 The T28 Macro Twin Flash 1 can be used with stereo microscopes that have a screw thread for attaching filters and supplementary lenses. Several Nikon and Olympus stereo microscopes have a 48 mm screw thread, and so with the aid of a 48→49 mm step-up ring, the Macro Flash Shoe Ring can be attached. For use with non-Olympus cameras, the exposure can be adjusted using the diffuser and neutral-density filters from the ND Filter Set T32 over the flash heads, and the film speed and exposure adjustments in the camera. Type: TTL Centralized Control with twin flash unit. 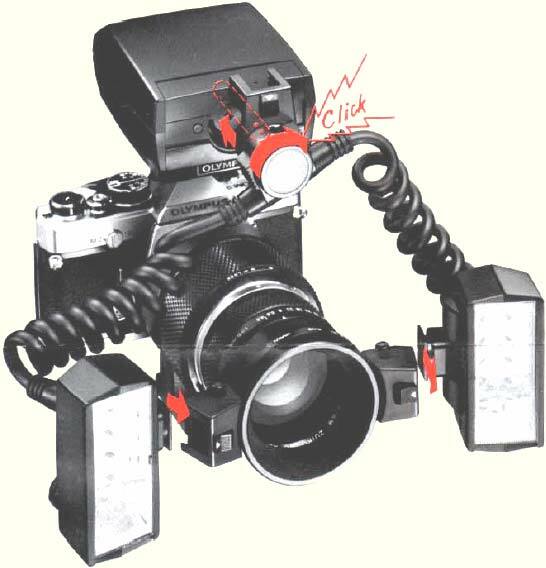 Guide Number: TTL AUTO: w/twin flash – 22(72); w/single flash – 28(92). MANUAL: HI 22(72) and LOW 9(29) at ISO/ASA 100, meters (feet) at 1 m flash-to-subject distance. Coverage Angle: 53° vertical, 74° horizontal (single flash). MANUAL: Selection of full flash GN/aperture/magnification: Via exposure calculator (w/single flash – GN28 exposure calculator, w/twin flash – ISO/ASA of the calculator should be set 2/3 stop lower). Illuminators: 8 bulbs built into each flash unit, operate on four 1.5V D batteries in optional 6V Power Pack 2, or AC Adapter 3.